Photo of Caravan Kids performing the Tarantella at last year’s Italian Festival, in Kingston. Join the Youth Company and Caravan Kids in the annual Italian Festival at T.R. Gallo Waterfront Park, Kingston, NY. 12:30pm. Free event. 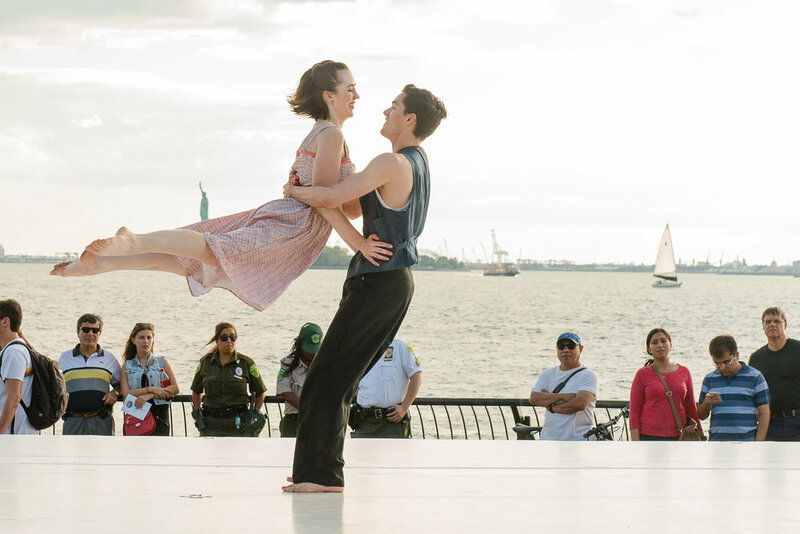 Photo from Turn Turn Turn of dance duo, Samantha and Brian Lawton at the Downtown Dance Festival at Battery Park, 2014. Photographed by Dariel Sneed. One night only! The Company will present a performance of our newest show, Turn Turn Turn: Celebrating Pete Seeger in Dance and Music at the Chandler Center for the Arts. 7:30pm. Tickets & Info. Youth Company Dancers during the Kwanza Celebration of Into The Light. Photo by Daniel Comb, 2015. Into the Light is The Vanaver Caravan’s Holiday Show, in collaboration with Arm-of-the-Sea Theater. This heartwarming performance, which features giant puppets, lively music, and dance, tells the fantastical story of a young girl’s journey around the world to discover how different cultures celebrate light in the darkest time of the year. Members of The Company will join our Youth Company & Caravan Kids for the Feature Performances. Into the Light at Sinterklaas Festival in Rhinebeck. Enjoy three half hour excerpted performances at 2pm, 3pm, 4pm. Church of the Messiah Epscpl, 6436 Montgomery St, Rhinebeck, NY 12572, USA. Free event. NEW! For the first time ever, we are presenting four feature-length performances at Kaatsbaan International Dance Center. Matinees at 1pm & 4pm. TICKETS & INFO. There are still a few spots left in our classes. Register Now.